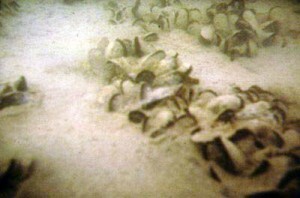 Suspension culture of Mytilus edulis has received renewed interest. Since 1996, the Maine Aquaculture Innovation Center (MAIC) Mussel Suspension Culture Working Group has been meeting to help develop mussel raft technology in Maine. This group initially consisted of about 75 participants who include mussel draggers, lobstermen, clam diggers, urchin divers, and other groups interested in fishing farms in Maine. Due to the pioneering work done by Richard Lutz funded by Maine/New Hampshire Sea Grant in the 1970s there has been renewed interest in mussel suspension culture in the U.S. This is primarily the result of successful culture and sales of mussels in the Canadian Atlantic Provinces where aquaculture development funding has been a priority. In Maine, early starts at suspension culture were plagued by eider duck predation, poor site selection, lack of culture technology transfer, insufficient capital and lack of an established market in the food service industry for high quality ($0.80/pound wholesale) mussels. Bottom culture of mussels was pioneered by Great Eastern Mussel Farms, Inc., producing about 4 million pounds annually for the supermarket trade ($0.50/pound wholesale) until the company ceased operations in the mid 2000’s. Growth in mussel raft production techniques with the Maine’s native mussel, Mytilus edulis coincided with start-up efforts involving the MAIC mussel working group and Great Eastern Mussel Farms. There were several obstacles to overcome at first, and solutions were tested. In order to increase the acceptability of suspension culture of mussels along the Maine coast; small lease sites were used, and rafts were selected as the structure of choice. Rafts provide a stable platform for working and produce high volumes of mussels in a small area (40 x 40 foot raft yields to 60 tons of mussels per year), and duck predation is averted through the use of a duck predator net. The latter obstacle is especially important to overcome since Maine has one of the largest recovering eider duck populations in the world (over 3,000 rafting ducks inshore from December to April). Lastly, raft culture can take advantage of the vast areas of ice-free deep water along the coast of Maine. The mussels grown on rafts are of superior quality. 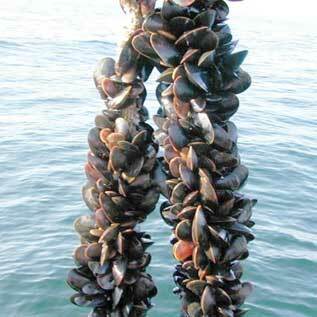 Wild mussels yield about 10 pounds/meat/bushel versus 24 pounds/meat/bushel of raft-cultivated mussels. One commercial farm is developing an innovative submersible mussel raft to allow siting in areas with significant ice cover in the winter months. MAIC gave a grant of $2,000 to the mussel working group in 1997 to study different types of material for mussel seed collection. In 1998, a private foundation gave the group $10,000 to purchase Spanish graders, socking machines and rope for field trials. This was followed by $100,000 in industry development, including 3 Scottish rafts (kits shipped from Scotland currently at Maine lease sites) 4 wooden rafts, and other smaller rafts along Maine’s coast. More information on mussel raft culture is provided through “The Maine Guide to Mussel Raft Culture” a 31 page booklet prepared in 1999 by the Island Institute.